I’ve bragged and boasted how Bear had never been sick. Well, I can still brag and boast a little. Just a smidgen. Yesterday, while we went out to Sunday Sessions in Grand Park, I had the smart idea in leaving him in his wet clothes, considering they were drying and I didn’t think it was necessary to switch him into dry clothing. I took the risk once before when I didn’t have any extra clothing on me so I figured why not? Remind me not to mess with danger. Bear ended up getting a runny nose on the way home and was feeling pretty congested. And when I say congested, I mean he wasn’t able to breathe while I nursed him. Yeah, kinda sucked. When he bathed, he wasn’t his usual playful self and instead, just sat in the tub. No bueno. So thinking that I have a congested baby, I need to do something about this. 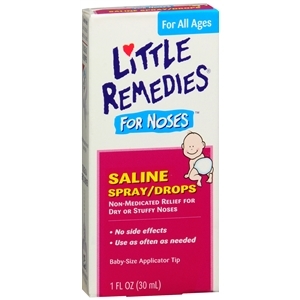 A while ago (and I mean a while ago…like probably a year ago), I purchased Little Remedies Saline Solution. To be completely honest, I didn’t think we would ever use it for him but you know what? It worked like a charm. It loosens the mucous for easier removal and believe me, kids have a lot of snot. We just received a big box of diaper wipes over the weekend and I didn’t think we really needed it. Hah! I’m convinced there aren’t enough diaper wipes in the world. I’m keeping Bear well-hydrated and we did give him some Tylenol last night just to make him feel better overall. So far today, he’s feeling a lot better and back to his normal rambunctious self. Here’s hoping for a snot-free Bear soon! And I leave you with Bear’s new favorite video. This is so weird.